A freshly baked pizza? In under 3 minutes? Right on! We count on the convenience of the ubiquitous vending machine to fulfill our midday craving for a cheap, salty snack. For more elaborate hankerings that cannot be sealed inside a flimsy bag (think French fries, cupcakes and freshly baked bread), we must lug our hangry bodies to the kitchen, take a trip to the store or at least place an order on Seamless. Some vending geniuses, however, have attempted to lessen the hardship of being a person who wants something and has to wait or exert a bit of effort in order to get it. 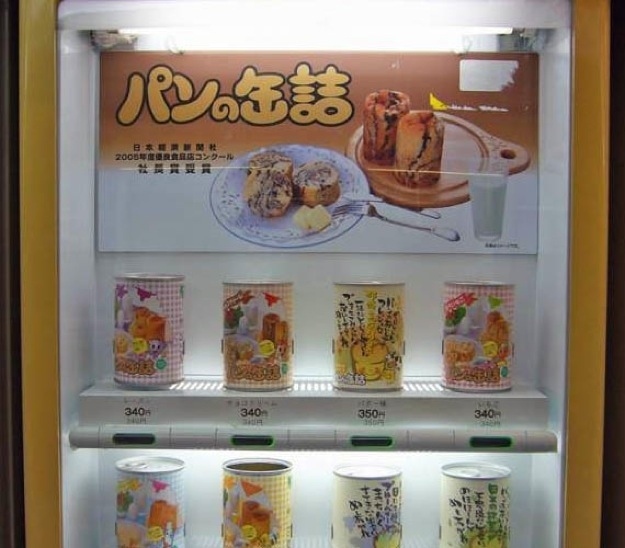 Check out these wildly impressive (and real) vending machines that make life so much more convenient. "The world's first pizza vending machine" cooks an individual pie with the topping of your choice in less than three minutes. The machine uses an infra-red oven contains enough ingredients for 200 pizzas before needing to be replenished. These fresh egg dispensing vending machines are set up by local farmers along the road in Japan. The machine can also be found at Glaum Egg Ranchoutside of Santa Cruz, where 24 cage-free chicken eggs can be purchased for three dollars. This LA-based luxury vending machine is quite an enigma. It's a very good thing this machine accepts credit cards: An ounce of quality fish eggs can cost up to $500. This burrito kiosk serves up freshly prepped burritos in 60 seconds. You can choose between chicken, steak and a vegan veggie burrito (there are even two breakfast options). If you want guac or sour cream on the side, it's yours. When it's 4 a.m. and there's no McDonald's in sight, you can cut out the middle man by enjoying a burger from one of these Febo dispensers in the Netherlands. Through the little windows you'll spot burgers, croquettes, fried chicken and more. If you've ever wondered if lettuce can be grown without sunlight, the answer appears to be yes. Japan's "portable garden" called the Chef's Farm uses fluorescent bulbs to churn out 60 heads of lettuce per day. When you're in a "kosher emergency," as the Times puts it, the Hot Nosh 24/6 comes to the rescue. The machine serves up glatt kosher bites like knishes, veggie cutlets and hot dogs. This cupcake dispensing ATM stocks up to 760 cupcakes at a time with up to 20 varieties. There are even flavors for dogs to enjoy. If you're seeking hairy crabs and all the shops are closed, you'll be happy to stumble upon one of these machines in China. Inside, the contraption is kept at a temperature of five to 10 degrees celsius to preserve the crabs in a dormant state. A banana's peel protects it from bruising and getting squished, so this dispenser is basically like banana armor. With a cardboard box and plexiglass to shelter the fruit, you can feel confident your banana is in tip top shape. In 95 seconds, a serving of French fries can be yours, and you don't even have to forgo the ketchup (phew). You want a hot dog and you want it now. That's fair. In under a minute, you can have your freshly grilled hot dog delivered on a freshly toasted bun. Bread in a can is the new sliced bread wrapped in plastic. Find it in Japan. 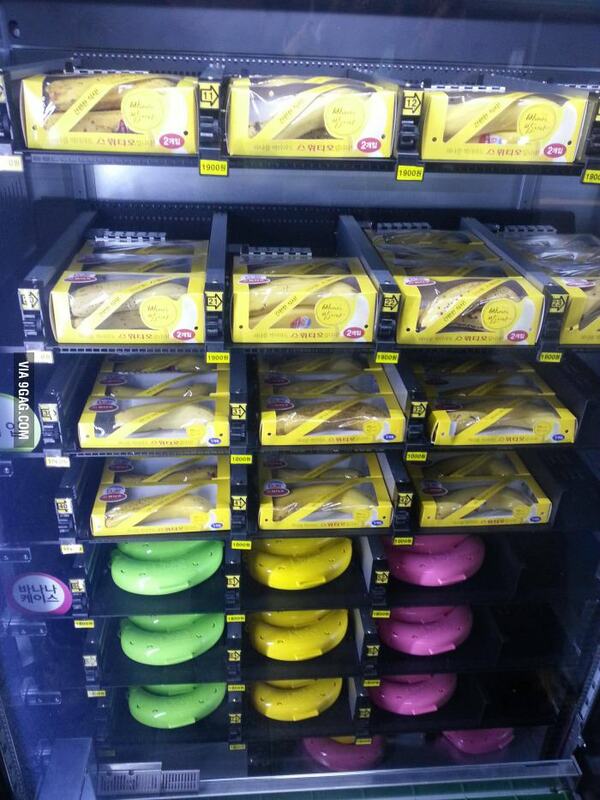 7-Eleven's mashed potato dispenser takes convenience to another planet. The "modified Slurpee machine" dispenses liquid 'tato that can be dressed with chicken, gravy or both. This healthy kiosk is stocked with a fresh array of salads and snacks that are mostly organic and made with locally grown produce. Even better? Whatever is not purchased from the Farmer's Fridge by the end of the day is donated to the local food pantry. Unpasteurized dairy sold from machines can be found all over Europe. These machines are particularly controversial, especially since raw milk laws in the U.S. have become more highly regulated. This machine found in Japan is equipped with hot water. Should this be renamed Instant Instant Ramen? A freshly baked French baguette never appeared so oxymoronic until it was dispensed from a vending machine. A French baker designed this contraption so his customers could enjoy fresh bread at all hours of the day.